I guess fabrics are just punnier. Thanks for this post. I'm trying to figure out how to sew a pouch for months. The pattern of them are lovely too. No, thank YOU for sharing it! I am fabric fanatic, can't get enough for them though I already have plenty. Someone called me CRAZY... lol!!! Thanks for sharing! Definitely plan to try one of these and will be sharing it with my blog followers because I know they will love these tutorials as well! I just love those little bunting bags. So adorable. Wow! I'm going to sew up a bunch of those super cute tissue holders to give as stocking stuffers. What a great way to make use of all those scrap pieces of fabric that I have way too many of...oodles. Hairdressers are the worst, surely? Sew....the fabric store puns are needling you? 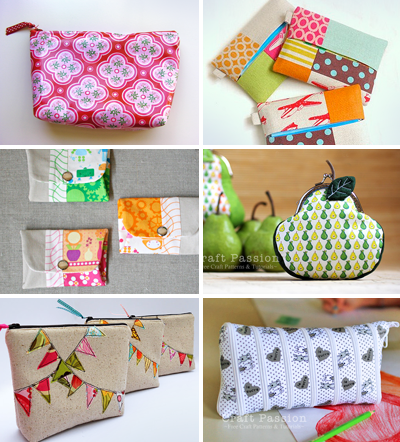 :-) Lovely pouches! I might see some of those under our tree this year! but I think hairdressers and barbers are the worst for puns! Orange you jealous, Jess, because there aren't a lot of good puns for designers? Come on, 'fess up! So cute! Maybe if I get started now, I'll have one done for Christmas next year, haha! That bunting one is just calling my name - well done, Suzanne! Adorable! Okay, you got me, Susan. I'm trying to think what I can do with "vector" or "Pantone" or "encapsulated postscript file" but I'm coming up blank. It's not fair. Hair salons, YES! Holy cow, you guys are right. That Flickr group is hilarious. And Deanna, I have to admit those are kind of cool. Heh heh. Love all these little tutorials you share with us! I love the pear coin purse. I pinned it for future makery! Thank you! The ball is actually a truncated icosahedron or dodecahedron with rounded side tabs. Very cool and fun to make. Thanks for sharing it.